It’s the day after my last VAMFF (Virgin Australia Melbourne Fashion Festival) event for 2019, and I’m feeling fashionably tired. In the past eight days, I’ve sat side of runways, glass of wine in hand, listened intently to inspirational panels at all hours of the day, visited designers sprawled all over Melbourne, and networked up a storm. It was an accident that I attended VAMFF this year, but I cannot help but feel an accident that was always going to happen. VAMFF’s focus on sustainable and ethical fashion was jaw-dropping. I’m not a runway veteran by any stretch of the imagination, but feeling like I attended an ethical fashion week, rather than a mainstream series of events, is a great feeling. The week kicked off with one of the best runways I’ve ever attended. Barefoot models, a line up of exclusively ethical fashion brands, a crowd full of my favourite ethical fashion blogger pals, and wine in the sunshine. Just the way I like it. I was introduced to two of my new favourite brands: Hause of Glassborow and Zoe.O The Label (pictured above via Kiah Lucey Photography). Picture vintage prints, overalls, and jumpsuits you would want to live in; that’s Hause of Glassborrow. I was impressed to find later out all materials are made from vintage or up-cycled fabrics in Sydney. Designer Joanna Glassborow is someone I am now following closely, as she makes waves in the sustainable fashion scene. Zoe.O The Label, on the other hand, wowed me with loose silhouettes and natural fabrics that I wanted to grab straight off the runway model- but thought that might be too OTT. Zoe.O The Label is also a big believer in pockets. I’m sold. After an incredible first event focused on ethical fashion, run by The Fashion Advocate, it was refreshing to sit down and hear about the nitty gritty side of the industry with The Possibility Project, Elk, and Seljak Brand. The conversation was formed from the above statement. I was made aware of the complexity of sustainable production and encouraged by the innovative technology these brands are implementing to reuse and upcycle the world’s waste. Sitting in a room with people scribbling frantically on notepads, listening to every word these intelligent individuals had to say about the state of our fashion industry, was refreshing. I had to blink my eyes a few times to believe it: usually, it’s just me with the notebook. After joining the ‘bob’ club after a snip at Bob Hair Salon, I hit Thursday morning with a jump in my step. Rocking my bright blue Tonic & Cloth Jumpsuit, I felt quite out of place amidst a sea of black at an 8 am breakfast conference (apparently black is the new black in Melbourne), but very much amongst my people as the conversation hit hard topics I love to dive into. Artisans of Fashion gathered a team of incredible thought leaders for a conversation surrounding culture, community, and the planet. Clare Press, one of my absolute inspirations, articulately ran the discussion. To spare you the time, the leading lesson from the morning: we need to acknowledge and preserve the ways traditional textiles are created. Designers need to design with them, and shoppers need to buy them. I’ll have my eye open for handwoven garments going forward. 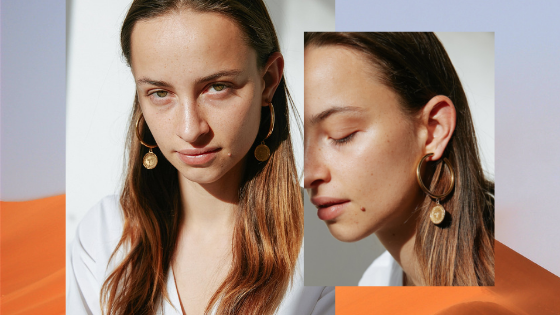 To escape the whirlwind of VAMFF for a quick breather, I hopped on a train to visit one of my favourite ethical fashion designers: Elle Evans. Elle and I sat on her back deck, eating bliss balls and drinking tea, talking zero-waste living and ethical fashion, before heading into her home-based workroom. Elle Evans produce swimwear and activewear for both women and children, out of ECONYL: fabric made from plastic waste, like old fishing nets, carpets, and fabric scraps. I had the honour of watching Elle complete the last trims of my very own Elle Evans leggings, while I drew cartoon mice with her beautiful toddler on the bench. My only thought: This is how slow fashion should be. Especially after renting a dress from Yarn Yarns this week, I am convinced borrowing, swapping, and re-using clothes is the way of the future. That’s why I attended the Global Fashion Exchange clothing swap, without anything to actually swap (after doing the minimalist challenge last year, I don’t have much more to giveaway). Is it creepy to attend a swap without clothes, and just people watch? I was amazed at the hundreds who attended, the polite way everyone sorted through clothes regardless of the excited crowds, and the second-hand scores others came away with, after using their buttons- the currency used to ‘purchase’ garments once you had donated your five garments to the swap. I concluded the week with a BANG. Joined by Kira, founder of this very platform, Sam of Eco.mono, fashion influencer Elisabeth van Roosendael, Jenna Flood of Ironic Minimalist, and Leah of Unmaterial Girl, we sat front row, cameras at the ready and slightly giddy on pre-show champers. Pictured above L-R via Fashion Journal: ABC.H, Hew, Kuwaii, and Lois Hazel. Perhaps I’m biased, as Kira and I spent several hours with the designer behind Lois Hazel herself this week, but Lois’ collection was out of this world, and definitely my favourite. The autumn shades, deadstock and organic hemp fabrics, were definitely a bit of me. I watched as her wrap dresses and cream culottes taunted me. VAMFF was a week I hope never to forget. I have my fingers and toes crossed that when I am an old lady, sitting in her Haus of Glassborow overalls in her rocking chair in the garden, I’ll think back to this week and remember it as the start of a fashion revolution. We’ll see.